A daunting challenge for residential architects today is to create good architecture when working in stiflingly regulated themed estates. This is our attempt to create a good building exploring the ‘Cape Vernacular Architecture’ asked for. The plan and building forms are traditional, but we overscaled the proportions of openings, ‘boggelkaggels’ and chimneys. This also allowed for more light and sun to enter the spaces. The detailing is kept very simple with uneven wall surfaces mimicking thick walls and sculptural cut-out picture windows, and buttresses. Internal spaces remind of the traditional with simplistic and minimal finishes; textured walls, timber floors, exposed timber roof structure and ceilings. A young family living the house to its full utilizing the private and semi private spaces very successfully. Careful consideration were given to orientation, insulation, ventilated roof construction, etc. to allow the alternative energy pellet system to work optimally. The house is cooled by a low energy evaporative system. 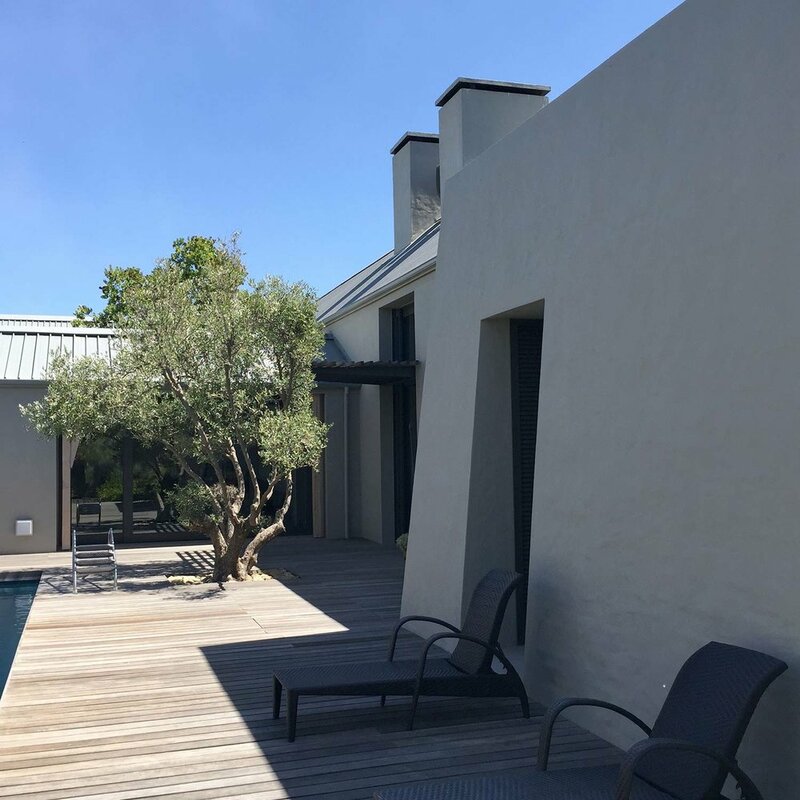 The grey water is recycled and the house is surrounded by a natural fynbos garden and a vegetable garden. The pond is a natural pond with natural reed bed filtration.